"Just sit right back and you'll hear a tale..."
Early on, since the film was first announced in 2002, there are rumors that the film will have the Rugrats in the jungle. Eventually, the rumors were proven right. In an interview with TV Guide (which I have yet to verify), it was said that the Rugrats will be stranded on an island in the Philippines. Eliza, who's also on that same island, will meet them by accident. The film will also have a bigger role for Susie, and feature references to "Titanic", "Survivor", "Lord of the Flies", and, of course, "Gilligan's Island". In January 2003, Simon & Schuster made its summer 2003 catalog available to its clients, which includes almost all the details that the TV Guide article included (even though I still haven't seen that article). In the film, Stu invites the family and friends on a luxury cruise. But, like the S.S. Minnow on Gilligan's Island, the tiny ship was tossed, and they ended up on what they thought was an uncharted, deserted island, with no phones, no lights, no motor cars, not a single luxury -- like Robinson Crusoe, it's primitive as can be. (Sorry, can't resist.) As the grownups try to sort out the problem, the Rugrats break loose, eventually discovering Tommy's TV hero, Nigel Thornberry, whose family is on that island, on assignment. The Rugrats were hoping that Nigel would take their families back to civilisation, but, Nigel accidentally bumps his head, causing him to talk like a baby (not unlike what happened in the Regarding Stuie episode). Furthermore, Spike will lose (at least, temporarily) his sense of smell. Will the Rugrats get back to civilisation? Of course they will, but, of course, getting there's half the fun. There was 4 books published that are based on the film. For details, and their covers, click here. The world premiere for Rugrats Go Wild was held Sunday 6/1/2003 at 3PM PT at the Cinerama Dome Theater in Hollywood, just a short distance from Klasky-Csupo studios (the first 2 Rugrats films debuted at Mann's Chinese Theater, while The Wild Thornberrys Movie debuted in Toronto). Expected to appear at the premiere is Bruce Willis, as well as the regulars from both TV series, and the film's producers. Unrelated celebs expected to appear include Jodie Foster, Eddie Murphy, Michael Chiklis, Larry King, Tony Hawk, Marilu Henner, Blair Underwood, Lorenzo Lamas, and Holly Robinson-Peete. As usual, the premiere is a charity event, benefitting Caring for Children & Families with AIDS, Ettie Lee Youth & Family Services, Hollygrove, and Vista Del Mar, through the Entertainment Industry Foundation. The soundtrack of the film, from Hollywood Records (a Walt Disney company), will be available in stores on 6/10/2003. Here's a list of songs that will be featured; songs in pink are written especially for the film. * -- Sung only by Angelica in film. ** -- Sung only by Angelica & Susie in film. *** -- Song appears only on soundtrack; not used in film. Please note that out of the album's 14 tracks, half of these will feature songs "sung" by the Rugrats characters (including songs sung by Bruce Willis & Chrissie Hynde, who will be singing as their characters, instead of themselves). Of the three films, this film has the most numbers sung by Rugrats characters -- 7 out of 14 tracks. In comparison, The Rugrats Movie had 4 Rugrats numbers out of 13 tracks, while Rugrats In Paris has only one out of 12 to 14 tracks (depending on pressing). Here are the other songs that appear in the film, but are not on the soundtrack; songs with no artist credited are instrumental versions recorded especually for the film. * -- Was to have been part of soundtrack, but was later removed. Songs in red were originally to have been part of the soundtrack, but was later removed; it is unclear if they will still be included in the film itself. In April 2003, theatrical posters for the film became available to theaters showing the film. 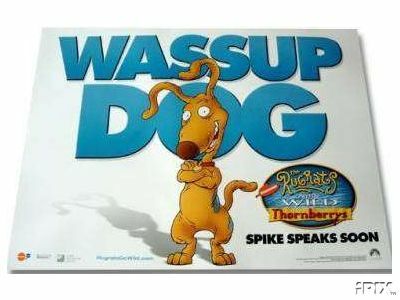 The first, teaser poster, shown here at left, features only Spike and the tag line "Wassup Dog?". 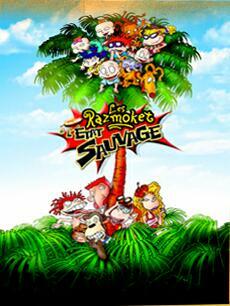 The second poster, shown here at right, features the Rugrats at the top of the tree and the Thornberrys at the bottom. Both posters from the Club Cooltoons Newsletter; © 2003 Viacom. 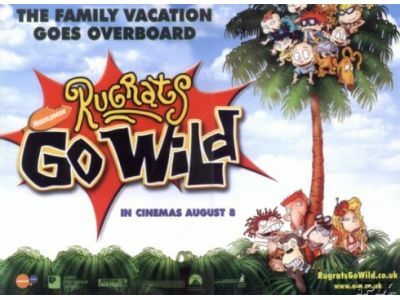 International distribution of Rugrats Go Wild will also begin in the summer, but not long after the US release -- the first known country (outside the US, Canada and parts of the Caribbean) to get the film is Britain, where it'll be released Friday, 8/8/2003. This is almost 2 months after its first release in the US. In the past -- for The Rugrats Movie, there was a 4-month gap between US and international release (Britain also); while for Rugrats In Paris, the gap was roughly 3 months (France being the first overseas country, in this case; the gap for Britain was almost 5 months). 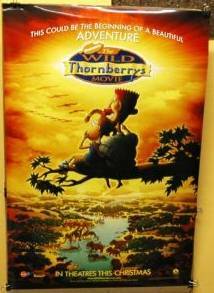 And we haven't forgotten about The Wild Thornberrys Movie, where there was only a gap of about 1.5 months between the US (12/20/2002) and Britain (2/7/2003). And in Britain, the film has an identity crisis -- the teaser poster (at left, from eBay) uses the name and logo of The Rugrats Meet The Wild Thornberrys, while the second poster (at right), has the Rugrats Go Wild logo and name. * -- Nick Australia has given 9/18 as the only release date for Australia. The Rugrats' third theatrical adventure will feature characters from another Nicktoon hit from Klasky Csupo -- The Wild Thornberrys. 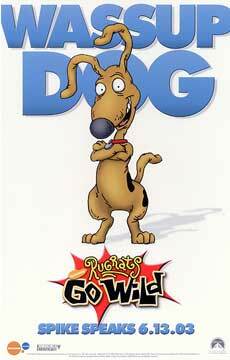 The name of the film will be "Rugrats Go Wild". Previous names given, but later rejected, were "Rescue Me!" and "The Rugrats Meets The Wild Thornberrys". The current name was first used in a trade ad at a licensee convention (see below), but was later rejected, only for Nick to use it after all. 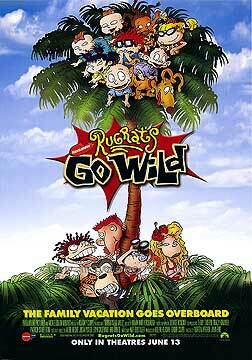 The latter name, "Rugrats Meets The Wild Thornberrys", was used in catalogs by Simon & Schuster, as well as in early press material, before Nick decided to stick to Rugrats Go Wild. According to the Done Deal site, Kate Boutilier, one of the writers of the first 2 films, will also be among the writers of this film, as well as a stand-alone Thornberrys feature, which was released in December 2002. Tapped to direct the picture are Norton Virgien and John Eng. Virgien has directed The Rugrats Movie, whbile John Eng has directed The Wild Thornberrys Movie. And now comes the million-dollar question: which Rugrats will be featured? The answer -- the classic, familiar, toddler Rugrats will take part in the film. There were rumors that the tweenage Rugrats will be featured in the film, instead of the original Rugrats, due to the success of the All Growed Up special, but unfortunately, Klasky Csupo shot those rumors down when they announced the start of the film's production on Friday, 12/7/2001. The first major star to line up for a role in this film is rapper LL Cool J, who will provide the voice of Piki, a handmade doll that says hip-hop phrases when his belly is pushed -- apparently, his role in the film is uncredited, as he is not listed in the credits. Also appearing in the film is Bruce Willis -- formerly of Moonlighting and Die Hard, he'll be the voice of Spike, who, of course, will be understood by Eliza. Also starring in this film is Chrissie Hynde of the rock group The Pretenders, who will voice Siri the clouded leopard. The character will be singing a duet with Spike in the film. Add Ethan Philips as Toa and Tony Jay as Dr. Lipschitz, and you got the entire supporting cast -- every voice in the film besides the main characters. There are 4 supporting actors in this film, as opposed to 24 for Rugrats In Paris and 18 for The Rugrats Movie. The crossover will be released in the US & Canada on 6/13/2003, about seven months after the stand-alone Thornberrys feature, which will be released on 12/20/2002 in the US & Canada; that film will have Eliza attend a boarding school, and feature guest voices of Rupert Everett, Marisa Tomei, Brenda Blethyn, Alfre Woodard, and Lynn Redgrave as Nigel Thornberry's mother. A made-for-TV prequel will have Nigel knighted in England, which will set the scene for the film. 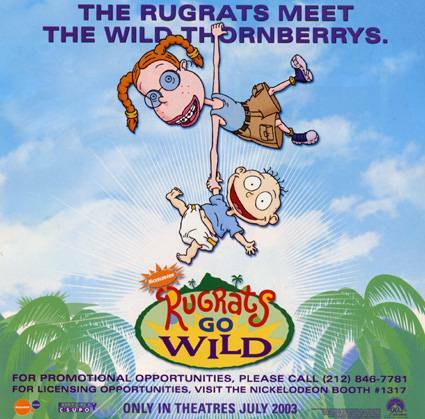 And below is the very first ad for the Rugrats / Thornberrys film. This was part of a program distributed to attendees at the New York Licensing Fair in June 2002. It should be kept in mind that the logo and/or the picture may change down the road; that ad was created so Nick would have something to show at the New York Licensing Fair. Also, the reason why a date of July 2003 is given is so that the film will be far away enough from A Series Of Unfortunate Events, a live-action film from Nick that is slated for release in theaters in the 2003 Holiday season (the crossover was originally announced for release at that time). Please note the film's early logo -- this was before they have chosen "Rugrats Meets The Wild Thornberrys" and reverted to "Rugrats Go Wild". Left: The logo for The Rugrats Meet The Wild Thornberrys, before they decided to keep the Rugrats Go Wild name. 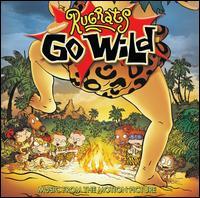 This logo was featured in Simon & Schuster's Summer 2003 catalog, publicising books based on the film, until it was decided that they'll stick with "Rugrats Go Wild".